Sign Pledge to TAKE ACTION! Join the Campaign for a NYC Council Resolution to Shut Down Indian Point Nuclear Power Plant NOW! 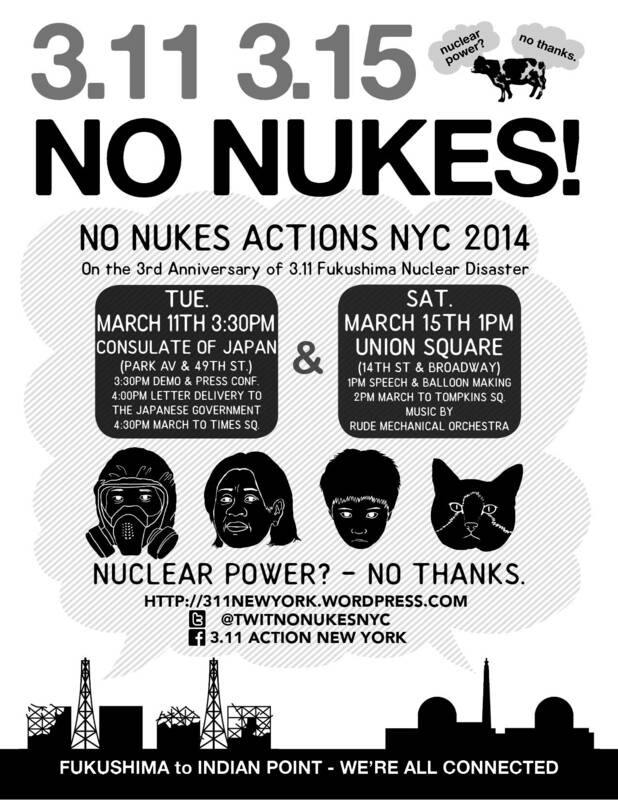 3.11 No Nukes Action group are organizing two actions for the 3rd Anniversary of 3.11 Fukushima Nuclear Disaster. 2PM MARCH TO TOMPKINS SQ. March 11th 2014 marks the third year anniversary since the beginning of Fukushima Nuclear Disaster in March 2011. This disaster was caused by not only the massive earthquake and tsunami, but the human error and irresponsibility of the state, nuclear industry and their supporters who prioritize profit over people. Countless issues remain unresolved at Fukushima Daiichi nuclear power plant, as well as in the surrounding areas with high levels of radioactivity. The radiation from the coast of Fukushima is also contaminating the Pacific Ocean, reminding us that we are all connected by the sea. Fukushima leaves us an overwhelming question; are there any safe places, food or water left for us, or for future generations? We New Yorkers also live next to Indian Point Energy Center’s two nuclear reactors, sitting right on Hudson River, 25 miles north of NYC. The utility owner Entergy is still operating the power plant, which releases radioactivity 24/7. Indian Point is on an earthquake fault line and one of the reactor’s operating license has just expired in 2013. At any nuclear power plants, danger is inherent and accidents will happen. While we observe an increasing number of natural disasters affecting our city, it’s no longer a question of if, but when Indian Point suffers an accident. And what about the massive amounts of radioactive waste? United States currently has no long-term solution for the highly radioactive nuclear waste being generated every day at over 100 nuclear reactors throughout the country. We will not forget Fukushima. Let’s connect and stand with the people in Japan and elsewhere struggling with the consequence of nuclear production. Join us & Take action! 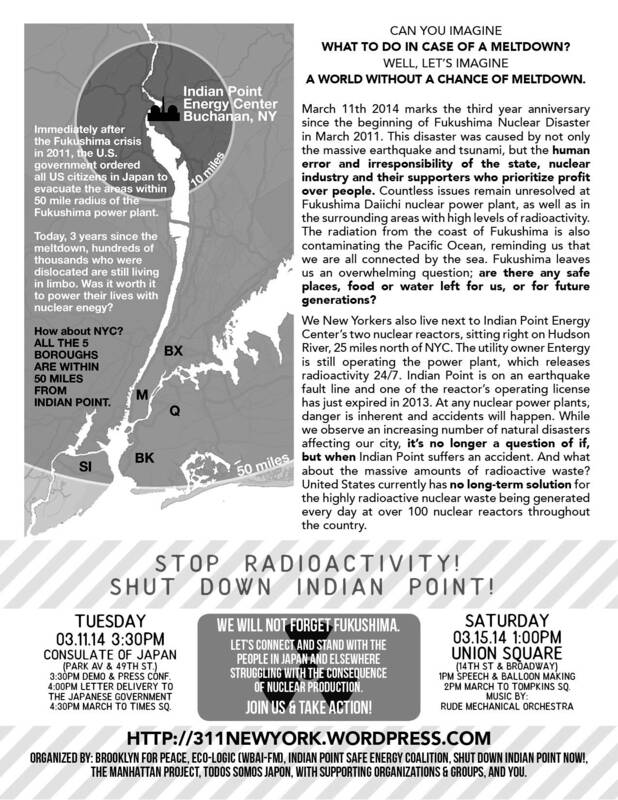 Organized by Todos Somos Japon, The Manhattan Project & Shut Down Indian Point Now! Until our elected “leaders” call for the IMMEDIATE phasing out of nuclear power (and nuclear weapons), our entire city, country and planet will continue to be at grave risk. Ask yourself WHY they are not talking about this in the debates. Also ask yourself WHY mainstream media doesn’t talk about it! The nuclear industry could never exist without massive subsidies by our corrupt federal government and a mainstream media that keeps it OFF PEOPLE’S MINDS. What most people don’t realize is that the mainstream media ARE the nuclear industry and the military industry! And guess what? GENERAL ELECTRIC isn’t going to tell you on NBC that their reactors are threatening the very survival of our species! Even Wall St. won’t even insure or finance or insure nuclear power! So why is this allowed to continue? There are lots of sane, safe solutions (that can create hundreds of thousands of much needed GREEN JOBS!) The people of Germany, France, and certainly Japan are quickly waking up to the alternatives. Why aren’t we?? Please New York, DO SOMETHING to remedy this situation NOW before it’s too late! Our future depends on the safe, immediate, permanent shutdown of this plant and other plants like it! Fukushima & Chernobyl are for real! June 12, 1982 – One Million People In Central Park… WE CAN DO THIS AGAIN! STEP #2 – Print / distribute / translate this flyer! Tell all your friends, neighbors and co-workers to do same! Click HERE to print out a PDF of the document. LET THEM KNOW how you feel about nuclear power! BE ACTIVE TODAY, NOT RADIOACTIVE and cancer-ridden tomorrow! SHUT DOWN INDIAN POINT NOW! NUCLEAR DISARMAMENT NOW! also take a look at the below New York GROUPS… or start your own! This entry was posted in Articles & Essays, Community Empowerment, Education & Empowerment, Environment, Farming, Heath, Immediate Matters of Importance, Movement Building, News, Nuclear Power, NYC, Outreach, OWS News, Peace, Photo / Video Journals, Politics, Sustainability, US Government, Video, War by weareone. Bookmark the permalink.